Welcome to the ODBD September New Release post and Blog Hop showcasing projects from Our Daily Bread Designs September Release! You can see all of the fun Septemer Releases here. Continue reading below to find out how you can win one of three $25 Gift Codes to the ODBD Website. The September release is full of fabulous Patriotic stamp sets/dies and a beautiful new Patriotic paper collection. Both of my cards showcase the new Stars and Stripes paper pad along with the Let Freedom Ring stamp set. 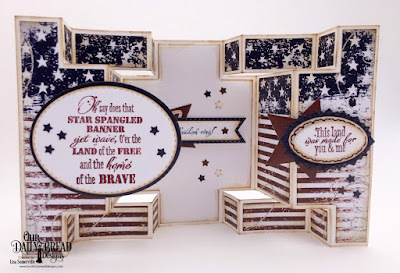 Using the Stars and Stripes paper pad, I used the Sunburst Technique to create the background for my card. When doing this technique, I cut two Navy card stock panels at 3-3/4" x 5. I used one to do the Sunburst Technique, leaving a slight space between the pattern paper. After all papers were adhered in place and trimmed, I used the Double Stitched Rectangles die to slightly cut down the panel, then layered it onto the other Navy Panel. The sentiment is stamped in Red Ink on White card stock and die cut using the Double Stitched Circles Die set. To embellish the card, I added stars using the Sparkling Stars die set. For a complete supply please see the details below. My next card features the new Double Display Card and Double Display Layers die sets! If you love Fancy Fold cards, but hate the amount of time it takes to cut, measure and score them, you are going to love these dies, and also the new Tri-Shutter Card and Tri-Shutter Layers die sets. The layering dies really make creating this card a breeze! It's so easy to place the layering dies over your pattern paper so you can see what the die cut panel will look like before you cut it! That really helps when planning out your patterns! To embellish my card, I added stars from both the Sparkling Stars and Double Stitched Stars die sets. Please see my complete supply list below for more details. Three randomly selected winners will each receive a $25 gift code to the ODBD Website just for commenting on the Design Team cards! You have until September 2, 2017 at 9:00 p.m. EDT to leave your comments. The Winners will be posted September 3rd, on Our Daily Bread Designs Blog, so be sure to check back there to see if you won! Both cards are GREAT!! I love the Double Display card. Hope to purchase these new die sets very soon!! Lisa, both cards are fabulous and festive. LOVE every layers and designs. Wow! Your second card looks like it would take such a long time to make. Thanks for explaining the way the die made it quicker and easier. Both cards are great; but those double display cards look somewhat complicated. For now, I'll stick with flat cards. That sunburst design is really beautiful. It's filled with inspiration. Your cards are amazing! Love your sunburst card. This release is amazing! Lovely work on these cards. This is a wonderful release. The second card using the Double Display sets is one I would love to receive. Thank You for sharing. Beautiful use of the papers-love these cards! Beautiful patriotic cards, Lisa! 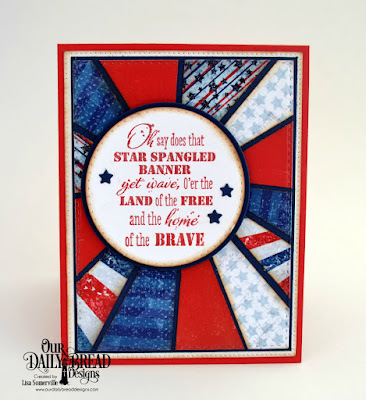 I love the sunburst on the first card and the placement of papers on your double display perfectly represents the flag with the stars on the top and the stripes at the bottom! Very creative as always, my friend! Hugs! Love your sunburst technique - great way to showcase the paper. Love the double display also! beautiful!! love those new dies! Wonderful cards. Love the beautiful papers you used on the Sunburst. Thank you for your ideas!! They are awesome!! I wish I was that creative but they help me get started. Thanks for your time!! Love, love, love the sunburst card! And the double display design with the paper is awesome! Lisa both samples are wonderful!!! I love how you used the paper and lined it up on the double display! Perfection! Such beautiful cards Lisa!! Love the sun burst design. Beautiful use of the sunburst technique on your first creation, Lisa!! Love the double display! So many awesome details and so patriotic! The line up of the dp is perfect. Wow, Lisa, the Starburst design is super cool and the double display is awesome! Love them both!